If you have come to help me, then you are wasting your time. But if you have come because your liberation is bound up with mine, then let us work together. 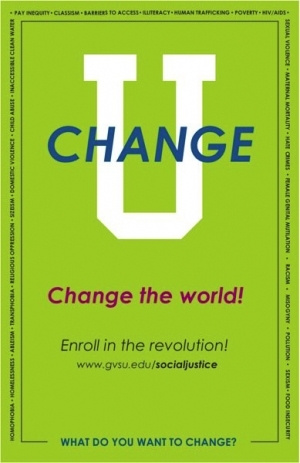 The LGBT Resource Center at GVSU is still accepting applications for the social justice trainings they offer in a program called Change U. Change U has two levels of trainings and the Change 1.0 applications are due this Friday for anyone interested in participating in these social justice training sessions. Change U 1.0 involves 8 weeks of 3 hour sessions that present social justice information from an intersectional perspective – looking at how race, gender, class, sexual orientation, disability rights, the environment, war and all forms of oppression intersect. There are guest speakers for each 8 week session and this year one of those speakers will be anti-racists author and activist Tim Wise. Change U 1.0 also provides an opportunity to discuss these critical issues with other participants, to make connections and to find out more about social justice is being practiced here in West Michigan and around the world. This project is open to GVSU students, faculty, staff and anyone from the greater Grand Rapids area. Change U 1.0 sessions begin On January 10. You can check out the entire schedule, download the application and read more about this project online at http://www.gvsu.edu/socialjustice/.